Farnham is an historically significant part of Surrey and is home to a comparatively large number of Georgian houses and a castle which was built in the year 1138. Make the most of your visit by taking your pick from our selection of hotels in Fernham below. Farnham is home to a number of attractions including Birdworld, a bird sanctuary that also has rabbits, guinea pigs and more. The star attraction however has to be the resident group of penguins. The animal theme continues at The Sculpture Park, which sees creations from all walks of life create a vibrant and alluring outdoor area with lots to see. Farnham Park allows visitors to enjoy a leisurely stroll through an area of natural beauty, while Waverly Abbey offers a unique experience to see the ruins of a 12th Century building. The town is accessible by rail and road, with easy access to the A31 road. 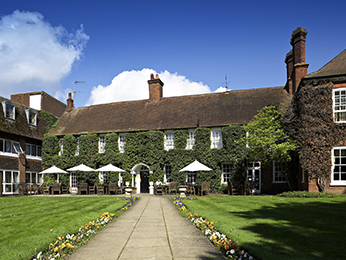 Booking a hotel in Farnham with AccorHotels couldn't be easier. Simply browse our selection of hotels below and choose one that best suits your needs. Booking online with AccorHotels offers a host of benefits, including our Best Price Guarantee and last minute and real-time room availability.